Men’s basketball held an open practice last week at the Yum! Center on Floyd Street. The intrasquad scrimmage was Cardinal fans’ first look at 2018-19 team led by head coach Chris Mack. The regular season begins Nov. 9 with Nicholls State at home. Until then, Mack will give fans another preview of the squad with “Louisville live” on Sept. 28. The outdoor event at Fourth Street Live! downtown will feature team activities on a portable court. Events like “Louisville Live” are unfamiliar to the program’s history, along with the basketball camp for the community’s youth that took place this past summer. Under Mack’s direction, men’s basketball is moving towards more fan engagement than ever before. Last month, Mack named his captains for the upcoming season. Graduate transfer guard Christen Cunningham and junior forward V. J. King were given the vote of confidence. Cunningham transferred to U of L from Samford as a guard with prolific scoring ability. The Lexington native recorded double figures in 71 of his 110 games for Samford, including 11 performances with 20 or more points. At 6-foot-2 and 190 lbs., Cunningham will most likely start as the two guard. Graduate student Khwan Fore, a transfer from Richmond, is the other probable candidate to start. King is the only returning starter from the 2017-18 season. The Cleveland native started all 36 games for the Cards during his sophomore year and scored double figures in 14 games. 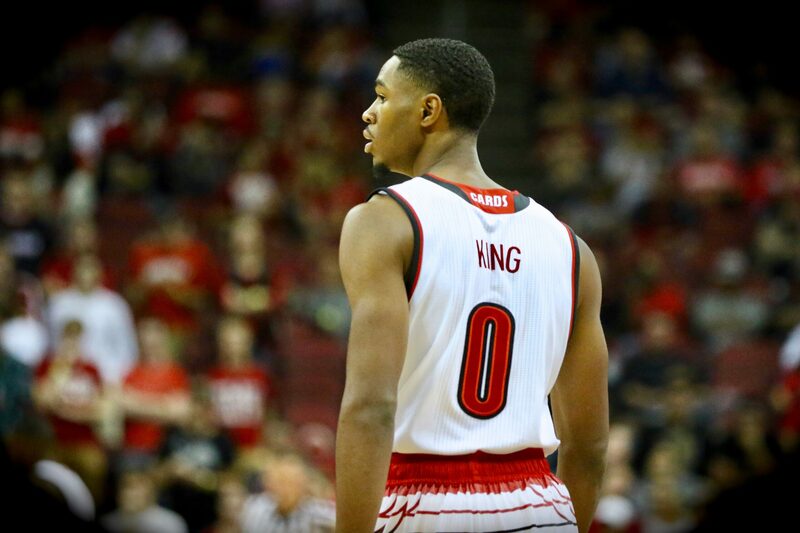 High expectations follow King as he steps into a leadership role for Louisville. Mack has a track record of utilizing skill sets such as King’s within his coaching system. If he improves, this could be a breakout season for V. J. During the three-hour rain delay at football’s victory over Indiana State, former basketball players Donovan Mitchell and Trey Lewis talked with the media in the press box. The duo are teammates in the NBA for the Utah Jazz. Both discussed the scrimmage that took place at the Yum! Center. Mitchell talked about Cunninham settling into his role as team captain. “[Cunningham] reminds me a little bit of [Quentin Snyder] with his patience, way to find guys and lead.” Mitchell said. In general, the team features a raw mix of players from last season and transfers. The group has garnered comparisons to the 2015-16 men’s basketball team and Lewis confirmed the similarities. Like any coach new to U of L athletics, Mack has a lot of expectations to meet. The city of Louisville has been used to a successful basketball coach for the past 40 years, from legend Denny Crum to the infamous Rick Pitino. As Xavier’s head coach for nine seasons, Mack guided the Musketeers to a 215-97 record and eight NCAA Tournament appearances. Mitchell is familiar with the coach from his time in college. Lewis echoed the praises after spending time with Mack at the intrasquad scrimmage.